Jerry Layne left his game Sunday after being hit in the mask by a foul ball, marking the umpire's second game-ending head injury in less than one month's time and third overall in 2016. 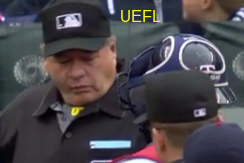 With two out in the top of the 1st inning of Sunday's Mariners-Twins game, Twins pitcher Hector Santiago threw an 88-mph sinker that Mariners batter Robinson Cano fouled into Layne's traditional style facemask. Layne was replaced for the remainder of the contest behind the plate by 1B Umpire and Acting Crew Chief Hunter Wendelstedt with 2B Umpire Toby Basner assuming duties at first base and 3B Umpire Tripp Gibson remaining at third. On August 31, 2016, Layne left his Blue Jays-Orioles plate game after taking a 94-mph pitch nearly directly to the facemask. On June 27, 2016, Layne was struck by a fouled-off 92-mph fastball in Atlanta and left that assignment as well.